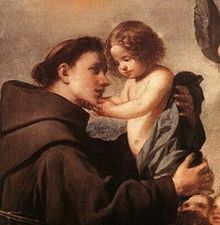 Anthony of Padua, O.F.M. (born Fernando Martins de Bulhões; 15 August 1195 – 13 June 1231), was a Portuguese Catholic priest. He was a friar of the Franciscan Order. He was born and raised in a rich family in Lisbon. Anthony was canonised as a saint on 30 May 1232, less than a year after his death. He is considered a patron saint of lost or stolen items. He goes that he had a book of sacred songs in which he'd written his own personal notes. A young novice from his complex of buildings decided to leave the order. As he was leaving, he stole Anthony's book. Anthony prayed for it to be returned. Some time later the missing novice returned to the order and asked to be taken back in, and returned Anthony's book. This was deemed a miracle. Anthony died in Padua, Italy. After his death, because of that incident, people prayed to Anthony when they had lost something or had it stolen. Some of them got their things back. Those were also deemed "miracles." They are what got him sainthood. This page was last changed on 30 August 2017, at 20:56.